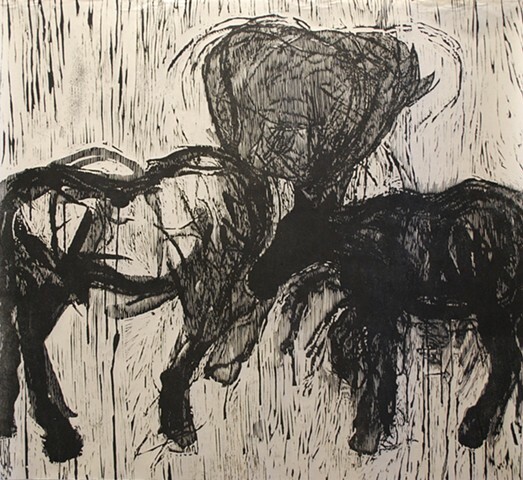 The horse in this work is a personal narrative, a powerful metaphor and an exploration of the thin line between wild and domestic. Spending time working with a domesticated feral horse, a mustang, and now working with a horse who has only known interaction with humans has provided me the opportunity to experience the interaction within communities of horses and between horses and humans. All share the establishing and communicating boundaries; respecting space. It has also meant considering the complex issues surrounding the issues of the wild horse / feral horse populations in the American West. Drawing and printmaking are companions in my work. I respect each for their unique qualities and processes and enjoy their similarities. One often informs the other. In recent prints, images are developed both in the field and continued in the studio. Waxed papers and marks made on both sides of paper build the image and color is both hand tinted and worked on the stones and plates prior to printing. The printmaking matrixes are vehicles for multiple unique solutions. Several plates often contribute to a single image, portions of larger blocks are printed to create new composition, and inking and pressure are manipulated resulting in a variety of image solutions with a limited number of blocks.